Dreams are such a fascinating concept. I have always had very vivid dreams, mostly on the strange and scary scale, occasionally weird and funny. No matter which side they fall on, they are always interesting; even when I have to leave the lights on to think about them. So I am naturally drawn to any and all fiction that focuses on this subject. Dreamology caught my attention immediately, and from the first page I was in love... With the dreams and the wonderful characters! Alice has dreamed about Max since she was a little girl. Max has dreamed about Alice since he was a little boy. From playing Lego's to African Safari's, Alice and Max have grown up together, at night while they are sleeping. Somewhere along the way they fell in love with each other, even knowing that the other wasn't real. It just didn't matter, because they at least had the night. When Alice and her dad move into her grandmothers home in a new city, Alice is miserable. Leaving her best friend Sophie behind, changing schools, living in the old home of her mother who left them when she was six, all of it is overwhelming. When Alice starts school and walks into one of her new classrooms, all of a sudden she is face to face with Max. Dream Max is standing right in front of her. She can't believe her eyes. But Max's reaction isn't what Alice thought it would be. He acts like he doesn't know her at all. He is cold to her. And he has a beautiful girlfriend, whom Alice can't help but like. She thinks she may be losing her mind, but Max saves her from an allergic reaction one afternoon and she knows... Her Dream Max is real. Now their dream worlds are bleeding into reality and they have to figure out how to stop it... and how to handle each other when they are awake. I adored every second of Alice and Max's story. Waking and sleeping, they were incredibly cute together. Alice loves the dreamworld, where she and Max float down a river of milk in giant Cheerios and Fruit Loops. Where they slide down unending staircases made of foam. Max is studious and quiet. He likes things neat and orderly. Having Alice in his real world life upsets the balance and he doesn't know how to handle it. The tension between them is palpable, but in a very teen way. It isn't over the top and it shouldn't be. Their interactions are entertaining and sweet, sometimes sad and frustrating, but always fun. There are several secondary characters that each play a major role in the story. Oliver is the first person Alice meets at school. He is fun and lighthearted and goofy. He brings the comic relief and he is also a great friend, even when his heart may be hurting. Sophie is Alice's best friend. She is the perfect best friend, always there for Alice even when she thinks Alice is crazy. She doesn't make a ton of appearances until the end of the book, but each one is better than the last. Alice's dad was involved in the story a good deal. This trend of missing/dead/uncaring/you name it parents is getting really old. It was nice to see a dad in this story who was present for his daughter. And finally, we have Jerry the dog. I love Jerry! The last thing I will talk about in this very long (for me) review are the dreams themselves. They are wonderfully creative and whimsical. I want to have dreams like these. 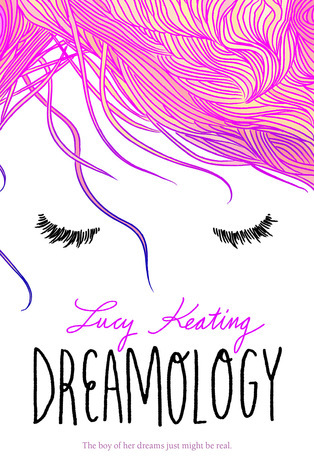 Lucy Keating's dreamworlds are imaginative and fun, romantic and silly. She brings in elements from the real world, including different characters we meet along the way, and incorporates them into the dreams in intriguing ways. The best part is that she actually wrote about dreams in her book titled Dreamology. All too often, the element that stands out the most in the synopsis ends up going by the wayside. She brings it to the forefront, and I loved it. I really can't think of a single negative thing to say. I truly enjoyed Dreamology. Lucy Keating has something special. Her talents for characterization and world-building are a force to be reckoned with and I can't wait to see what she does with it in the future. Recommended for: Everyone. 13 year olds, 17 year olds, 33 year olds. This is a book anyone could love!